Of course this is no legal or tax advice — just my personal experience so far. I’m a freelance software developer and run a WordPress support service (HootProof.de) with a team of four. All my work is online and I usually don’t meet my clients (or team members) in person. I bill by the hour or package. Most of my clients are businesses from Germany and Switzerland, some from Austria and other EU countries, very rarely third party countries. Until now I’ve had my business in Germany, as a so called Einzelunternehmer. This is the simplest form of business entity here, and it was a great and easy way to start. My business profit is basically my gross income, so all profit is subject to income tax (simplified). My team members and contractors invoice me, so I don’t have any employees. I am also personally liable for anything that could go wrong. However, with growing revenue and complexity, declaring my taxes and profits has become gruesome. I don’t fully understand it anymore and finally got a tax consultant this year — who charges me close to 1000€ in fees for last year’s tax declarations (accounting not included). I don’t even know at this point (August 2017) how much tax I owe for 2016, but it’s several thousand Euros. I do all my German accounting myself, using a SaaS for about 20€/month and about 3 hours of work per month, including invoicing, filing expenses, and monthly VAT declaration. I could consult my CPA for every expense I file, but truth is I don’t and I often wonder if the way I file them is correct and entirely legal (think semi-personal travel expenses, semi-personal electronics, business coaching, complex VAT situations with clients/suppliers from other EU countries). I’m also legally required to keep and store invoices that I received on paper. It’s become quite the pain. And although naturally this needs to be taken seriously and feels oh so productive — it doesn’t drive my business forward. It just needs to be done, as correctly and efficiently as possible. Also, I have been a digital nomad for about two years now, spending about 9 months per year abraod, traveling and working from anywhere. I want to immigrate to a non-EU country within the next few months. This further increases my desire to optimize my setup. Necessity of a physical address: It sounds so mundane, but the legal necessity of a permanent physical address and regularly checked mailbox just doesn’t work with my lifestyle anymore. I know there are services that scan your mail and deliver it to you via email, but to me that’s not enough. I recently had two serious incidents of almost-missed physical mail that could have ended in very expensive legal procedures. Just because I was away for a couple of days. And don’t get me started on the sheer industry of adhortatory letters/warnings. Tax system: It’s not really the amount of taxes that bother me, it’s the complexity. Germany is known to be the most complex tax system in the world, with the largest number of tax laws. Bureaucracy in general: So many seemingly simple processes still require lots of paperwork — from insurance to changing your permanent address or getting a translation of your driving license. Don’t have a permanent address? System failure. Business is tied to a physical address: As a solo business owner, my business is tied to my own permanent address. Moving between states (recently did that) or perpetual travel makes it very complicated and includes lots of paperwork. That is a bit better with a private limited company (GmbH) but then your accounting and setup costs go through the roof. Don’t get me wrong — I’m very grateful to be a German citizen in this century and to have grown up here — it’s a great country to live in and its passport opens many doors. But the truth is, I feel legally vulnerable here, especially with my location-independent lifestyle and online business that doesn’t quite fit the system yet. And this kind of headaches are just not something I want to waste any more energy and money on. I want a simple, safe and affordable business and personal setup and be able to focus on my business and personal life. As you might have heard by now, the small Baltic country of Estonia launched its innovative e-residency program in 2014. The name is quite misleading — it’s not an actual residency, a citizenship or even a visa. It’s basically just a registration and form of identification that allows you to use some of the Estonian government services, such as opening and administering a company. The e-residency alone does not allow you to visit or live in Estonia. There is however, a pathway to temporary and later permanent residency (read: Schengen visa) through the e-residency, provided you make a certain amount of revenue for several consecutive years. Since I’m a EU citizen, I am not really interested in that and haven’t done any further research on it. Being in the EU, Estonia has very similar economic laws to the rest of Europe, which presumably gains you trust with European customers and, if you’re from the EU yourself, means that you basically know how things work (culture, law, economy). Not in detail maybe, but you get the gist of it. It looks much more trustworhty than the Cayman Islands or similar locations with a somewhat shady image. The setup of a company with the e-residency is extremely cheap and fast (see below). Furthermore, you can get accounting and tax services for far below 100€/month. Agencies in typical offshore paradises such as Malta, Cyprus or Hong Kong typically charge several thousands for the setup of your company, and you’re basically tied to them for the continuous administration. Most things can be registered and administered in English — not in Cantonese *winkwink*. Once set up, everything is entirely online and paperless. No in-person meetings or mail required. Welcome to the 21st century (finally). You get an EU VAT ID, which is necessary for some services. EU privacy laws apply — which still seems to mean something to some (mostly German) customers. I expect other countries to follow suit with similar programs soon, and I welcome the entrepreneurial approach that Estonia is taking to winning over small businesses from all over the world. People of every citizenship are eligible for the e-residency. The application process is a simple online form and costs 100€. I had to provide some basic information about myself, a recent biometric photo, a copy of my national ID card (or passport) and the purpose of my application (i.e. why I wanted to establish my business in Estonia). Picking up the e-residency card has to be done in person, either in an Estonian embassy or consulate, or in Tallinn. The pickup location has to be chosen at the time of the application. My application was approved via email a couple of days later. 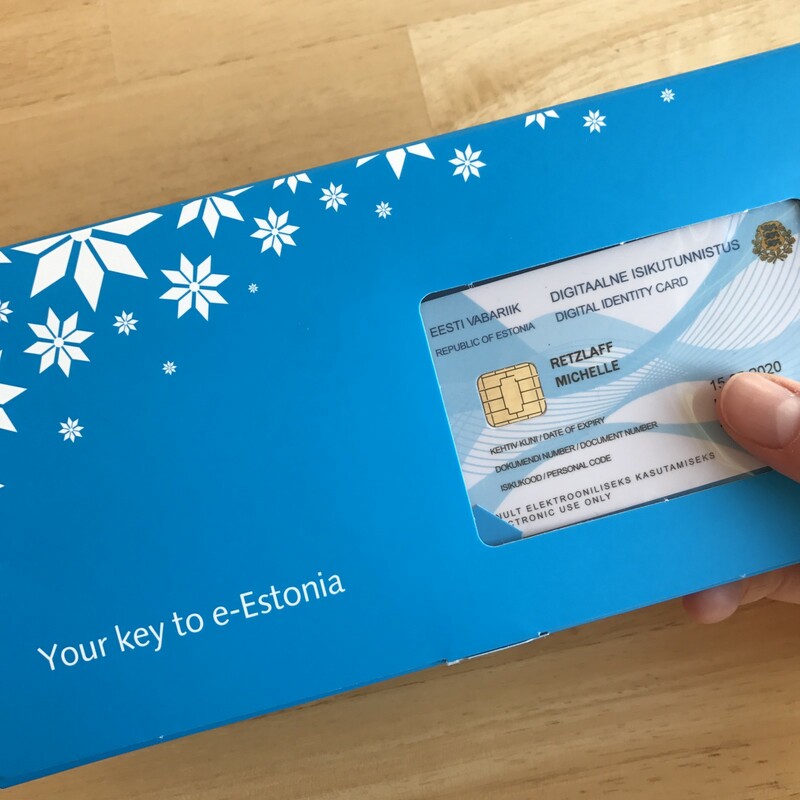 Another four weeks later, I was invited to pick up my e-residency card at the Estonian embassy in Berlin, where my fingerprints were scanned and I received my little blue e-residency box. My e-residency card and the box with the card reader, PINs, and instructions. The box contains your personal e-residency ID card, your PINs, and a USB card reader. That’s all you need to use the services of e-Estonia and sign documents online. Installing the necessary software is free and easy and you’ll get used to using the card and PINs very quickly. Pro tip for USB-C-MacBook Pro users: Depending on the type of USB-A dongle you use, the card reader won’t work without and additional USB extension cable. The next step was registering my company in Estonia. You can do this directly with the Estonian online government services, but I chose to sign up with an agency and have them take care of it for me. Thanks to many recommendations from friends and other digital nomads, I chose LeapIN. They specialize in digital-nomad-like single founder online businesses and help you set up your company and do all the accounting, invoicing and tax declarations. Depending on the type of your business, they charge about 60–100€ per month for all the gruesome (non-)paperwork. And they’re always there to answer your questions. I’m so happy to know these things in good hands now. There are several other companies with similar services and different specializations, so I invite you to do your own research before choosing. Assuming you’re not familiar with Estonian business administration or the language (just in case), I strongly suggest you use such a company instead of doing it all by yourself. I signed up with LeapIN just after my e-residency got approved and they made the process of registering my company very easy and smooth. I ended up registering a private limited company (OÜ) with a (somewhat voluntary) share capital of 2500€ (that’s the minum, the “limited” aspect of your company only takes effect after paying it, but you can do business before that). The registration cost another 180€ and was completed within 3 days (comparison: registering a limited company in Germany costs a minimum of about 800€ in notary fees and takes months, just witnessed that). Different from my German solo business, which only carries my own legal name, I had to choose a name for my OÜ. LeapIN provides a name checker to help choose a name that does not conflict with any registered trademarks in Estonia or the EU. Of course, no business without getting paid. Opening a business bank account with a physical Estonian bank still has to be done in person (that is about to change though). There are three major banks for business accounts in Estonia: LHV, SEB and Swedbank. I chose LHV because they are cheap (2€/month for the debit card, no other account fees), and they have an API integration with LeapIN, so LeapIN can automatically balance my books and declare my salary taxes. The fin-tech startup Holvi is another alternative for those who don’t want to travel to Estonia to open their bank account, but the fees start at 30€/month. To get started really quick with a temporary solution, check out the TransferWise Borderless account, as described here. In order to open my business bank account, LeapIN provided me with the pre-filled forms which I signed digitally and they also made the appointment for me. I went to Tallinn for the appointment with the bank, signed the paperwork and picked up my MasterCard debit card. I could have done it in one day, including flying back and forth from Berlin. I later activated my bank account online — the online banking is in English of course and you login and authenticate your transactions with your e-residency card and PINs. The bank will also advise you on how to pay your share capital into your account. Thinking of combining all the in-person work in one trip to Estonia? Unfortunately, I don’t think it’s possible to pick up the e-residency card AND open the bank account in one short trip to Tallinn. As soon as you have the e-residency card, you need to first register the company (which takes a few days). Only after that you will be able to open the bank account, and it will take them a couple of days to get your debit card ready. So maybe it can be done within two weeks, but probably not significantly faster. Although if the bank would send you the debit card, they might be able to open the account with you anyway and send you the card later. So if you need to do it this way, ask the bank and your agency. Or try to pick up your e-residency card in your permanent location if possible. This is basically where my experience ends — other than one paid expense I haven’t used my new Estonian company yet. But I’d like to share one more thing with you. Estonia is no tax haven. But there are some nice opportunities for perpetual travellers/people without tax residence or residence in a country with no or low foreign income tax. Also, the sheer simplicity alone is very appealing to me. First of all: The profits of the company are not taxed. So no need to waste time artificially reducing your profits at the end of the year just to save on taxes. Focus on what grows your business instead and look for ways to reinvest your profits purposefully. You don’t have to pay any of these — you’re free to leave all the profits in the company to reinvest or save. As a solo founder, by recommendation of LeapIN, salary payments are split into 30% board member salary and 70% employee salary. This is due to the assumption that, as the sole founder, you provide administrative/managing as well as expert services to the company. The board member salary is taxed at 20% + 33% social tax. The social tax is void if you can prove that you pay social contributions in another EU country. The employee salary is not taxed. So, altogether this leaves me at a flat tax rate of just under 20%. This is a tax that the company pays — so for every 100€ that I pay myself as a salary, the company also pays 20€ in taxes to the Estonian state. Also, apparently there is no law stating that you have to pay a board member salary at all, and you can split it at different percentages. The lower the percentage of the board member salary, the lower the effective tax rate. LeapIN told me that “[it] is not advised to pay employee salary only, because one could question whether the board member duties (which are attached to a single-member company management) are performed really for free”. Dividends are taxed at 20%, so for every 100€ paid in dividends, 80€ go to the share holder (you) and 20€ to the state. Your personal income is still taxable as foreign income in your country of tax residence. If that’s nowhere or a country with no/low tax on foreign income, well, you’re in luck. I am so happy and relieved to know my business in Estonia and all the administration in good hands with LeapIN. I’m still figuring out how to take care of the everyday stuff such as invoicing correctly and paying my own salary, but I’m optimistic it will all be very smooth in the long run and will free up so much time for me that I can use to work on my actual business. I might write another post on my everyday business admin (invoicing, receiving payments, accounting with LeapIN, paying salary etc.) once I’ve gathered some experience. The journey of location independence, entrepreneurship, and creating my best work.